Led Zeppelin’s red-carpet reissue series comes to a messy, intriguing climax with Presence, In Through the Out Door and Coda. This latter-day triumvirate documents a period clouded by clashing creativity, debilitating injury, substance abuse and, ultimately, the tragic death of drummer John Bonham—drama that tends to overwhelm the music itself. Sure, by the mid-‘70s, Zeppelin were past their spellbinding Zoso prime, but they never experimented with as much vigor as they did on these three underrated LPs. 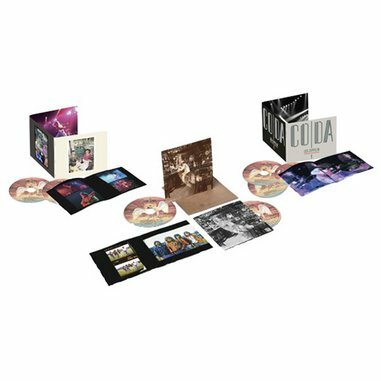 Like Jimmy Page’s previous deluxe remasters, these new sets are fitfully revealing, littered with extras that even obsessives will write off as fluff. But the albums’ scattered brilliance has only deepened in the past four decades. In many Zep-head circles, 1976’s Presence is the band’s masterstroke, a return to the blues-based, hard-hitting panache that catapulted the quartet to stardom. But only epic opener “Achilles Last Stand” merits that cult following. It’s the band’s true prog moment, a 10-minute barrage of Page’s overdubbed guitar orchestrations, John Paul Jones’ galloping bass riffs, Bonham’s punishing drum fills and Plant’s mystical imagery. After that, Presence runs out of surprises. It’s the starkest, leanest Zeppelin LP: Several cuts including “For Your Life,” “Royal Orleans” and “Hots on For Nowhere” are defined as much by space and silence. The band’s primal force is impressive, but it’s hard to shake the feeling of treading familiar ground. Plus, Plant, recovering from a car crash that left him wheelchair-bound, sounds a bit strained and weak; his bluesy squall on “Royal Orleans” is almost an impression of himself. In Through the Out Door, recorded in Stockholm after a three-year break, still divides fans with its quirkiness, but its fearlessness gave the band vital new blood. With Page and Bonham crippled by heroin and alcohol addictions, respectively, Plant and Jones led the charge by experimenting with keyboards and venturing into realms both spacey (10-minute behemoth “Carouselambra”) and sugary (synth-propelled ballad “All My Love”) territories. Page famously dubbed In Through the Out Door as “soft,” and the album tends to get dismissed by head-bangers, but that’s unfair. Bonham’s “Purdie Shuffle” on “Fool in the Rain” is the mother of all rock grooves and the spirited rockabilly of “Hot Dog,” with Page’s drunk-sloppy Telecaster, proved the guitarist hadn’t misplaced his axe. The scattershot leftovers of 1982’s Coda retain their charms—the percussive, droning “Poor Tom” should have never been cut from Led Zeppelin III, and face-melters like “Ozone Baby,” with Jones’ snarling eight-string bass, proved the band could hold their own with the burgeoning punks. It’s hard to imagine how a scraps LP could yield any noteworthy new scraps, but Page managed to slot in a few gems—including a groovy, previously unreleased instrumental, “St. Tristan’s Sword.” The “Bombay Orchestra” versions of “Four Sticks” and “Friends,” recorded during Page and Plant’s 1972 visit to the region, are intriguing as cultural exercises, though not particularly illuminating. In keeping with the previous reissues, these new “Reference Mixes” are unnecessary. Once the initial curiosity subsides, there’s zero reason to play them—unless you’re writing a Masters thesis on reverb variances. (At least Plant’s ridiculous deep voice on the reference “Royal Orleans” garners a chuckle.) A couple other charming surprises are scattered throughout: Piano-driven Presence instrumental “Ribs & All/Carrot Pod Pod (Pod)”—which reads like an afterthought song title Thom Yorke might cook up while stoned—resembles a less psychedelic version of “The Rain Song,” second half surge and all. Page is 71 years old. The vaults are certainly empty. Given the strained relations of the living band members, a reunion tour appears impossible. For all practical purposes, this is the end of Led Zeppelin—the true coda of an unrivaled career in rock extravagance. Warts and all, it’s a fascinating curtain call.